Yesterday was Memorial Day and with the 3 day weekend behind us, construstion was in full swing today. We are completely shocked at everything they've accomplished since we went over to our house just 2 days ago! 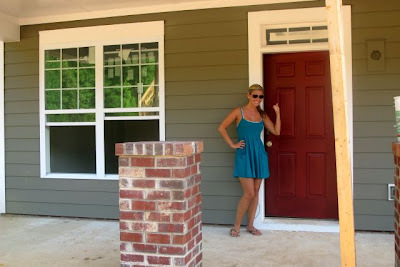 For starters... our front door has been painted and we are loving the color we chose! Our walkway to our front door has been framed and we can see where our planters will be. 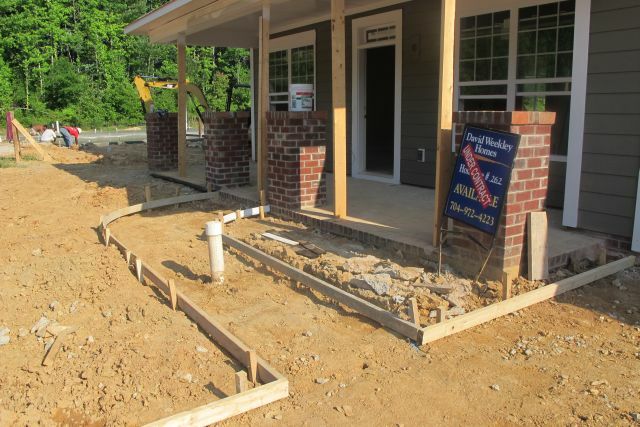 Look... Our sidewalk has been framed out also! Our mantel and granite have been applied to our fireplace. And to be honest, this is not the fireplace of our dreams and it never was. We had little to choose from and did our best with our choices. 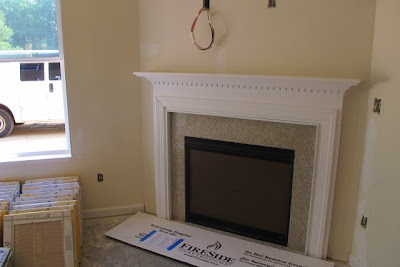 I don't care for the white mantel and we plan to one day make it all stone... Oh, and the entire inside of the house has been painted this buttery color. Notice the tiles on the bottom left of the picture? 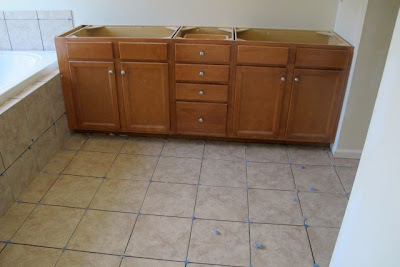 They're our kitchen flooring -- Exciting stuff! We are so excited obout our cabinetry! It's really neat getting to pick everything at the Design Center, but it's nothing like seeing it in person... nothing! 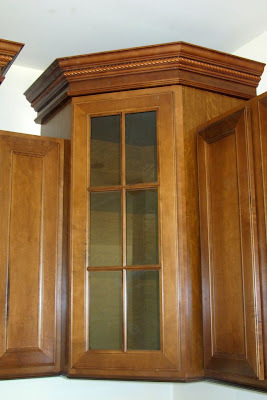 Love this corner cabinet, the molding on top and the lazy susan in the bottom cabinet! Don't you love the "braid" that Bryan chose to add to the molding? Such a classy small touch! Upstairs guest bathroom. This bathroom was suppose to only have 1 sink and be much smaller than this. I put my foot down and made sure we got a double sink upstairs. This meant that we had to push the wall back in the bathroom to make it larger, which took away space from the guest room next door. 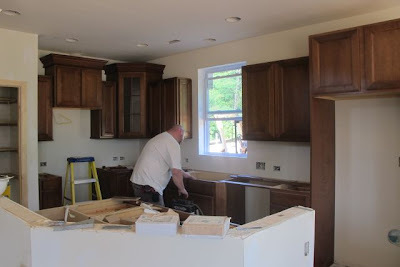 Now that we see this cabinetry for the 1st time, we know we made the right decision! 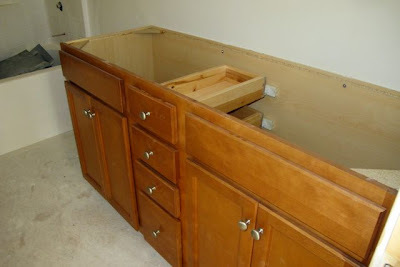 A double sink was a must!! 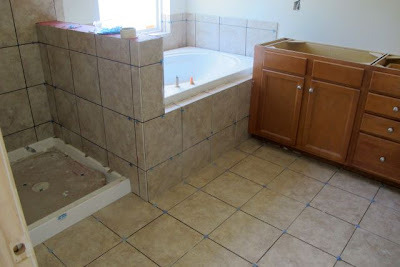 Our fully tiled master bath is being installed. 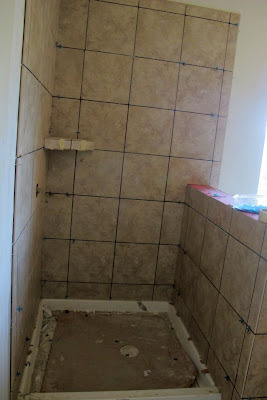 No grout yet, just spacers between each tile. We love the color! The shelf was an extra and was not cheap, but totally worth it! I'm standing in the bonus room taking the picture into our hallway to 2 guest rooms, 1 guest bathroom on the left, the childrens retreat is straight ahead (where the window is) and our master is to the right of the childrens retreat. Downstairs into the kitchen and family room. 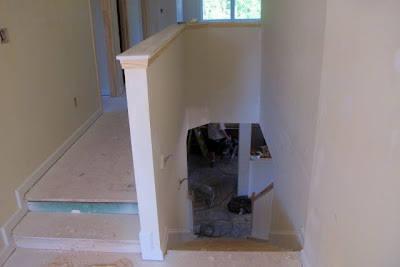 Oh, and we now have bannisters! This might just be the most rewarding experience we've ever been through! I just can't wait to see the finished product! I feel like there are lots of white mantles in the south, haha. Will your baseboard and trim be white? Everything looks great, LOVE the bathroom! I know you are so excited!! Oh where to start with all the things I LOVE!!!! I love it all!! 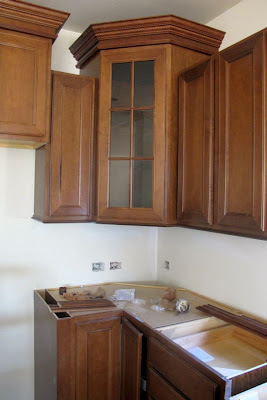 But especially the door color and the kitchen cabinet color!!! Love the hallway upstairs and your tub looks divine!!!! You must be on top of the moon!!! I absoultely love the colour of the house and door! And the bathroom looks awesome. All of it looks awesome actually! It's all coming together so nicely, you guys must be eager to finish up! SO exciting! Everything looks great and i love the red door! The fireplace is pretty, and i don't mind the white mantle. Once you put some stuff on it, i'm sure it will come together nicely! Omg everything is looking gorgeous Kate! wow girl its look great :) woohoo! 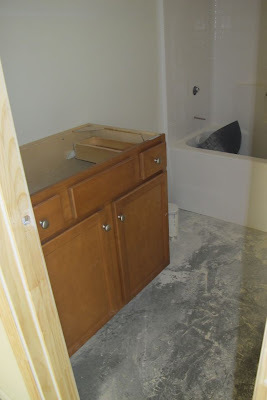 can't wait to see what it all looks like after you put furniture in! Once again, I am jealous and excited for you! It is looking so great! 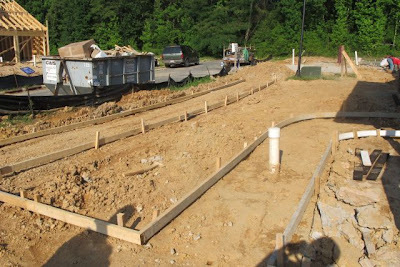 That is wonderful that the finished product is exceeding your expectations! I LOVE the braid in the molding! It's all coming together!!! :) SO CUTE! Hey B, I just showed my parent's the pics of your new home and they said, "Beautiful new home, congratulations!" from your S.C. Mom & Pops! Your post has everything that is obtained complete and really useful.The pictures are much the better. Looks like living photos. This post is very good. Thank you for presenting a very good post. All pictures are so nice. This credit totally photographer. I think everyone live this. I love your house design and colorful door.I think every one like this.Thanks a lot for sharing with us. 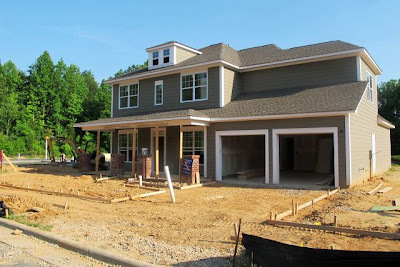 Very creative and amazing post, house, door, furniture everything is awesome. Totally looking awesome and this fancy for me. Thanks for sharing your post. Your post image is really nice. You can make attractive image by use Raster To Vector Service. I hope, it's will be help to make a good image. Your Design looking nice.Thanks for share us. I am always love this kind of work its great work you have shared its spectacular and most authentic things. Your post has Many important information which is very useful for me. Many thanks for the post. Excellent and aristocrat creation. You are my work inspiration. Always follow your post. This is really an interesting post.keep updating more for us.Thank you. It's really a great app for Bloggers! For the Photo Restoration Services you must have clipping path service to get perfect result. Pick monkey is a very good app for photo editing.Thanks for sharingIt's really a great app for Bloggers! For the Photo Restoration Services you must have clipping path service to get perfect result. Great look dear and the decoration is also good. Love your design and beautiful house as well. i have same like that but one different i have car room with 1 door and it's very hard to open and close all time. but you select 2 doors here that's really good. Great post, thanks for sharing these ideas with us. i am one of the followers of your blog. I love this blog. Thanks a lot for writing such an amazing writing. Clipping Path Service is one of my favorite services. This service is great for graphics design. It is such an incredible matter which gives me pleasures in my mind. It's truly a great app for Bloggers! For the Picture Remediation Services, you need to have clipping path service to get an excellent outcome.